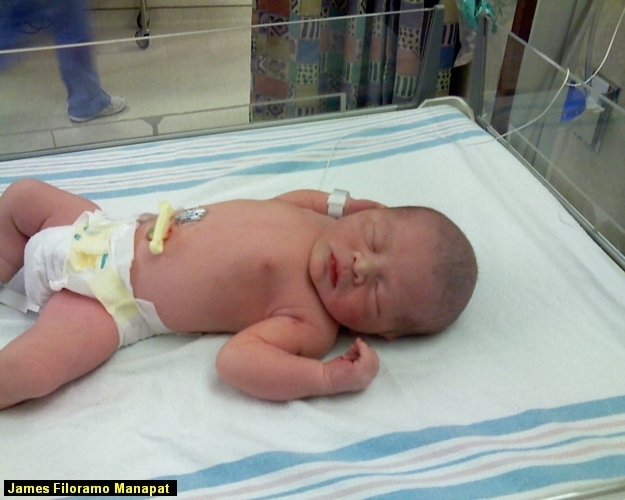 James was born on April 29, 2007 at 1:10pm; 7 lbs 9oz and 20 1/2 inches. Everyone is doing well and Miles was very excited to have a new baby brother. 5/7/2007: The evolution of Miles' new room. Check out the old wallpaper and how we turned our guest room into Miles' new room. 5/3/2007: So having a new infant boy is what's new. We had just finished Miles' new room and had moved him over to it on Saturday 4/28. I had just spent the last couple of weeks stripping wallpaper, skim coating (with Nathaniel's help), and painting. Miles chose the colors; orange and yellow, and I had just hung the poster for one of his favorite movies (The Yellow Submarine) in his room. After Miles first night in his new room James new it was time to come out (and delay Nirvana's defense for her dissertation which was originally scheduled on 5/2) and shortly after 1 on Sunday James arrived. Anyway there will be new updates to come but I think I need to adjust to having a new born again before I get into to flow of keeping you all up to date with James and Miles. If you want to get to all the old galleries and stuff click here or on Miles name up top. So you wanna drop me a line? Send a email to me.